Part cultural icon and part invasive nuisance, tumbleweeds have an intriguing and tangled history. July 1, 2016, 11:31 a.m.
Like cowboys, wagon trains and buffalo, tumbleweeds are icons of the Old West. These twisted balls of dead foliage rolling across deserts and the open range are staples of Western movies and the American imagination. But the truth about tumbleweeds isn’t so simple. They may be romantic symbols of our national love affair with the Wild West, but tumbleweeds are also invasive weeds called Russian thistle, and many modern-day Westerners fear they’re taking over. 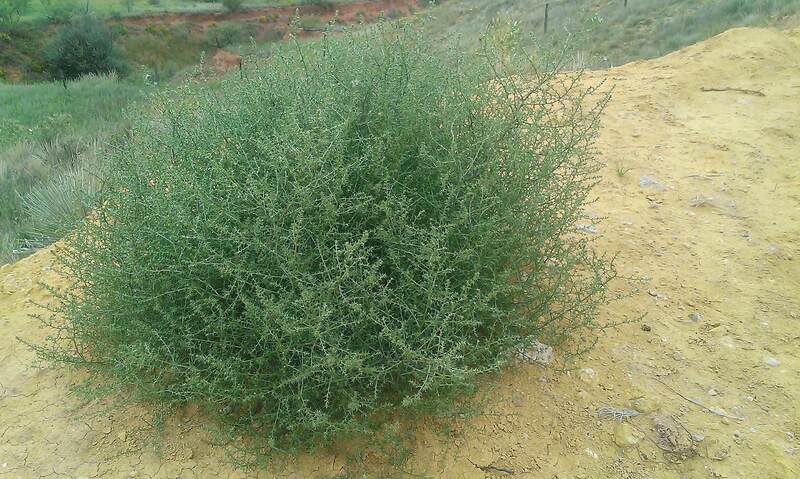 In 1873, Russian immigrants arrived in South Dakota carrying flax seed that was apparently contaminated with Russian thistle seeds (Salsola tragus). Once sown, these invaders from another continent quickly sprouted, unhampered by natural predators and diseases to keep them in check. Each winter after Russian thistle plants die, the brittle bushy parts snap off at the roots and blow away, dispersing seeds wherever they tumble (about 250,000 per plant). Because Russian thistle thrives on little precipitation and easily exploits disturbed land stripped of native species, it was able to quickly take hold in the vast agricultural fields and overgrazed rangelands of the arid West. By the end of the 1800s, this intruder had already rolled its way across most western states and into Canada, carried by wind and even railroad cars. A government botanist sent to investigate in the early 1890s could barely believe his eyes: "One almost continuous area of about 35,000 square miles has become more or less covered with the Russian thistle in the comparatively brief period of twenty years." When we think of tumbleweeds we rarely picture fledgling Russian thistle bushes, which many consider beautiful with their reddish purple striped stems, tender leaves and delicate flowers. Growing from six inches to three feet tall (with some sprouting to Volkswagen Beetle size), they later develop sharp spines. Many animal species feed on the succulent new shoots, including mule deer, pronghorn, prairie dogs and birds. Russian thistle hay actually saved cattle from starvation during the Dust Bowl of the 1930s when other feed wasn’t available. But there’s a down side. Tumbleweeds have never stopped spreading. Nearly every state in the U.S. is now home to Russian thistle, as well as several newer tumbleweed species that arrived as immigrants from around the world. The ongoing drought out West has been a particular boon for these ubiquitous raiders, launching a recent explosion of prickly spheres rolling across mesas and through canyons and towns, and even creating a new giant hybrid species that’s currently sweeping across California. Tumbleweeds were already a detested farming pest and fire threat back in the late 19th century, but that didn’t stop them from becoming immortalized in 20th-century Western movies as rugged roamers, symbols of our national reverence for resilient individualism, wide open spaces and rambling frontier freedom. Two Westerns were named for these shrubby lone drifters — a 1925 silent film called “Tumbleweeds” and a 1953 Audie Murphy flick named "Tumbleweed." A 1935 Gene Autry movie titled "Tumbling Tumbleweeds" also featured a hit song by the same name. Tumbleweeds continue to inspire everything from book and film titles to restaurant, business and band names — a testament to their mythical force first etched into the American psyche through the power of the big (and little) screens. The war on Russian thistle and other tumbleweed species stretches back almost to the time of their accidental arrival. Tried-and-true management options include applying pesticides and mowing down young plants or yanking them out before seeds have a chance to develop. But these methods are often expensive and time consuming. In response, scientists have begun testing several biological options, such as killer insects that can take out tumbleweeds naturally and more efficiently. In addition, the U.S. Agricultural Research Service recently announced the discovery of two promising fungal pathogens that infect and kill tumbleweeds. Not surprisingly, the fungi were uncovered in infected Russian thistle plants growing on the Eurasian steppes — the original home of tumbleweeds.